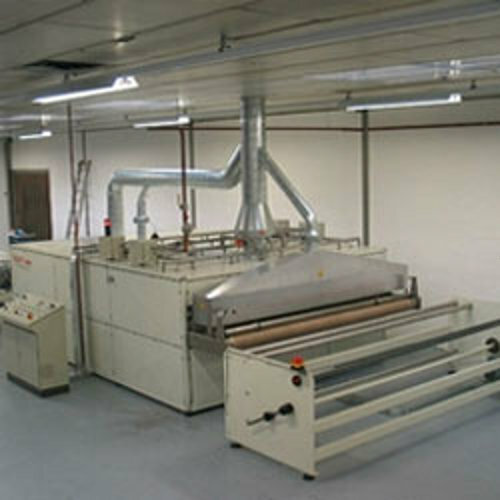 Infrared Paper Coating & Drying Machine processes have proved its importance in today's time where the paper industry has undergone tremendous change and conventional drying method is replaced by high intensity electrical infrared drying and coating. Here, in this working situation, high intensity infrared drying allows evaporation of eight to ten times more water than conventional drying method per square meter which provides for improved quality, fast immobilization, space saving as well as simplified sheet runs. Functioning as highly penetrating energy that has much higher drying rate in comparison to convection or conduction systems, some of the advantages of using this technology in paper coating and drying applications include providing quality surface coating from quick coating immobilization, allowing negative reduction of scale on initial dryers, allowing simplified sheet movement because of compact infrared dryer, providing for improved porosity, allowing for lower coat weight and more synthetic on the surface coating as well as bringing decrease in restoration time from sheet breaks or stops. Infrared as a technology has gained high importance in the current day functioning of appliances especially in the field of paper industry involving application of paper coating and drying. Here, the high intensity infrared drying allows evaporation that is eight to ten times more than conventional drying method which provides for fast immobilization, space saving and simplified sheet run. In terms of working, infrared functions as electromagnetic energy which falls between ultraviolet as well as microwave energy in spectrum where the heating effectiveness is governed through emitter emissivity, paper emissivity, emitter temperature and emitter surface area. As highly penetrating energy, it has much higher drying rates in comparison to convection (Hot air dryer) or conduction (Steam cylinders) systems. Advantages of Infrared drying allows better heating effectiveness which is governed by emitter emissivity, emitter temperature, paper emissivity and emitter surface area. Here, the highly penetrating energy provides advantage of much higher drying rates in comparison to convection (Hot air dryer) or conduction (Steam cylinders) systems. Further, the other advantages include providing quality surface coating from quick coating immobilization, allowing negative reduction of scale on initial dryers, allowing simplified sheet movement because of compact infrared dryer, providing for improved porosity, allowing better coverage or less fiber swelling and show through. Some other benefits include allowing for lower coat weight and more synthetic on surface coating, decreasing restoration time from sheet breaks or stops, allowing more control over process due to fine tuning ability and limiting possibility of web damages during emergency stop due to instant cooling down ability. Dynamics of Drying is based on high-intensity IR systems that are built on working mechanism of HI -IR Drying system which on the coated sheet is different from conventional energy source like Hot Air Dryers or Steam Cylinders. Further, the intense penetrating capability that results from high intensity as well as short wave length also helps in removing negative temperature gradient in sheet as high percentage of infrared passes through it. Further, the infrared energy penetrates sheet along with radiant heat transfer where the energy on hitting sheet is either absorbed or gets reflected back on interaction with each particle of coating/sheet. This uniform heating is highly important from point of view of quality and process efficiency where IR drying leads to rapid drying of coating color to immobilization point, thus resulting in predictably uniform coating surface with typically excellent printing characteristics. IR dryer offered come with salient features involving approval by various prestigious installations throughout India with indigenously designed finish so as to meet world standards. Here, world class, reputed quality infrared emitters are used that feature steel construction with high intensity of IR radiation up to 600 KW / m2. These also feature gold or white coated reflectors with quartz built sheet cover that is transparent to infrared radiation, thus protecting emitters from splashes as well as making it easily cleanable. The air cooling also helps in enhancing life of the component with presence of air impingement and exhaust of vapors providing for increased process efficiency. The dryer also comes with immediate 'on' and 'off' switching of emitters or Thyristorised (SCR) power regulator so as to provide for step less power variation with provision of automatic safety interlocks against breakage in web, machine stoppage, blower failure. The dryer system is also backed with readily available spares so as to provide uninterrupted functioning at customers end.